Ricky Bobby is the dim-witted yet tenacious protagonist of the comedy movie Talladega Nights: The Ballad of Ricky Bobby. Then it dawned on me: This is like watching the fictional character Ricky Bobby win the election. Where does Ricky Bobby come from? Talladega Nights came out in theaters on August 4, 2006. As the title implied with its reference to the Talladega Superspeedway in Alabama, Ricky Bobby (Will Ferrell) is the name of the main character and a number-one NASCAR driver. But, his supremacy is challenged by French racer Jean Girard, who he ultimately loses to. The rest of the movie follows Ricky Bobby’s life and his efforts to regain his former glory. As a character, Ricky Bobby is a patriotic, foolish guy who is so devoted to his career that he has tunnel vision about it. The antics of Ricky Bobby allowed him to be relevant in pop culture almost as soon as the movie came out. At the box office, the film grossed $148 million, making it a commercial success that reached a large audience. The writing was also specifically done with NASCAR drivers and fans in mind, with in-jokes peppered throughout the film. This spoke to NASCAR and non-NASCAR fans alike, who both enjoyed the film for its comedy. 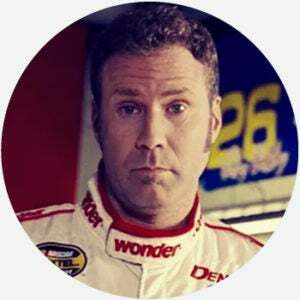 In the film, Ricky Bobby is an embodiment of a stereotype of southern culture combined with his absurd humor, true to Will Ferrell’s acting style. The combination of the two might be why people enjoy the character, as his humor is incongruent with the typical southerner stereotype. The character experienced a brief resurgence in search interest when his dream house from the movie was put up for sale for a hefty $4.2 million in 2017. As a comedy, the film has a number of memorable moments and lines from its central character. One quote is when Ricky Bobby says that when he wakes up in the morning he “piss[es] excellence.” Ricky Bobby also insists on praying to “baby Jesus” in particular, despite being told that Jesus did in fact grow up. There’s also a sequence where his rival tries to make him say “I love crepes” and he makes a big production out of refusing them. Because of his personality and antics, others are often compared to Ricky Bobby. Notably, when driver Carl Edwards crashed in 2009 at a race at Talladega, he got out of his car to run across the finish line like Ricky Bobby did in the movie, with a commentator saying that it was “shades of Ricky Bobby.” As the movie is liked by NASCAR drivers, it’s not uncommon for them to reference the movie when racing at Talladega. In fact, driver Kurt Busch got his car painted like Wonder Bread, just like Ricky Bobby’s car in the film. In 2017, basketball player Chris Paul mentioned Ricky Bobby by name when asked if his primary goal was to win a championship and quoted him by saying “If you’re not first, you’re last,” speaking to his own winner-takes-all competitive nature. Ricky Bobby is not generally seen as an offensive character, though some might take issue with certain jokes he makes in the film referencing Jesus.